Do you barely have time to tick everything off your to-do list, let alone fit a workout in? Do you find yourself putting everyone else in your family first and not making time to look after yourself? Well, there are plenty of ways you can fit small workouts in to your day, even as a busy parent. As part of my challenge from AXA PPP healthcare to “Own Your Fears”, I have been working on making time for exercise, and here is how you can find time for Fitting In Fitness too. I could give you about 30 different reasons why I don’t have time to workout, and I bet you could do the same too. But the reality is, if it’s something that is important to us and we really feel the benefit from it, then we need to make the time for it. You don’t have to schedule in hour long workouts, as there plenty of little ways to fit in fitness. 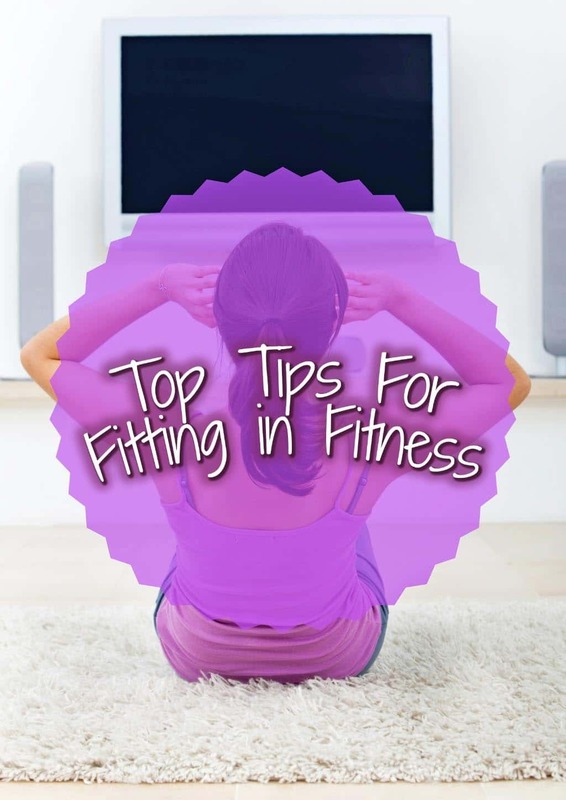 Do you want to be kept up to date on more posts like this one for Top Tips For Fitting In Fitness? Please subscribe to the blog mailing list (it takes 30 seconds). You will get sent the new recipes straight to your inbox. Your email address won’t be passed on to anyone and you will never be spammed. I really try to schedule in 45 minute workouts a few times a week, and that was part of my challenge with AXA PPP healthcare to work on my confidence, but the reality is I just can’t fit that in. Avery is going through an incredibly clingy stage at the moment, where if I am around, she has to be sat in me or being held constantly. Even at playgroups, she won’t go off and play, so it’s pretty draining and I can’t workout when she is around and when she is in bed the last thing I want to do is workout. A few months ago, I would have used this as an excuse to just not workout at all. I have a very demanding and clingy toddler – I can’t possibly workout. Well, that’s where there has been a huge shift for me. Instead of using it as an excuse, I am just adapting and finding ways I can workout. Learning to let go of expectations and adapt to my new life as a parent is a learning curve, but it’s time I made my health a priority. If you have been following my posts over the past couple of months, then you will see that I am working on my confidence and body positivity at the moment. 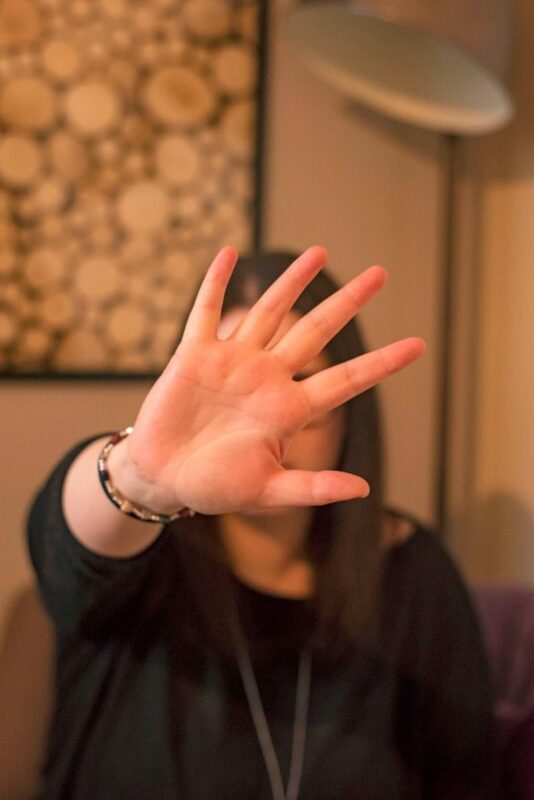 It all stems from my fear of being in front of the camera, because of the way I see myself. AXA PPP healthcare have challenged me, over the next few months, to Own Your Fears and work on becoming a more confident, healthier and happier me. After chatting with my AXA health coach, Amy Creedon, we agreed that exercise has a huge impact on my mental health and increasing this would really help with my challenge to eventually feel more confident in front of the camera. Basically, when I workout, I feel much better about myself. But how do I fit in exercise with a clingy toddler? Small bits throughout the day, and I incorporate Avery in to it as much as possible. Here are 10 ways to fit exercise in to your every day routine. I know I say it over and over again, but never underestimate the power of walking – especially when you have a young child. Make the most of those nap times and put them in their push chair or in a baby carrier/sling and get outside for a walk. In the early days, this did wonders for my mental health. 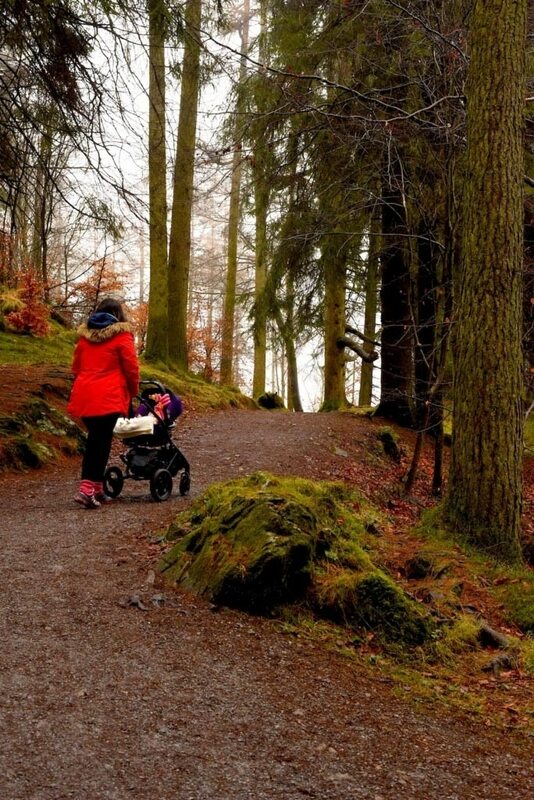 With a newborn it can sometimes feel like you are trapped inside, but even just a 20 minute walk whilst they nap can make a difference to your fitness levels. It’s also important for kids to get outside and have some fresh air and vitamin D. Feel like kicking it up a notch? Get yourself a pram that is suitable for running with and take baby out for a run with you. They will probably love how bumpy it is! Do you have a kid that just won’t let you put them down? Use them as some added weight to body weight exercises. Obviously always make sure that you are able to hold them safely still, but they will actually find these a lot of fun. I have been doing this since Avery was just a few weeks old, and I had her in a sling whilst I did these in the very beginning. How I just hold her, and lift her up in between each rep for an added move. You can do squats and lunges like this, or sit on the sofa and lift them up and down 10 times. Doing that with a 20lb toddler will build up your arm muscles in no time. 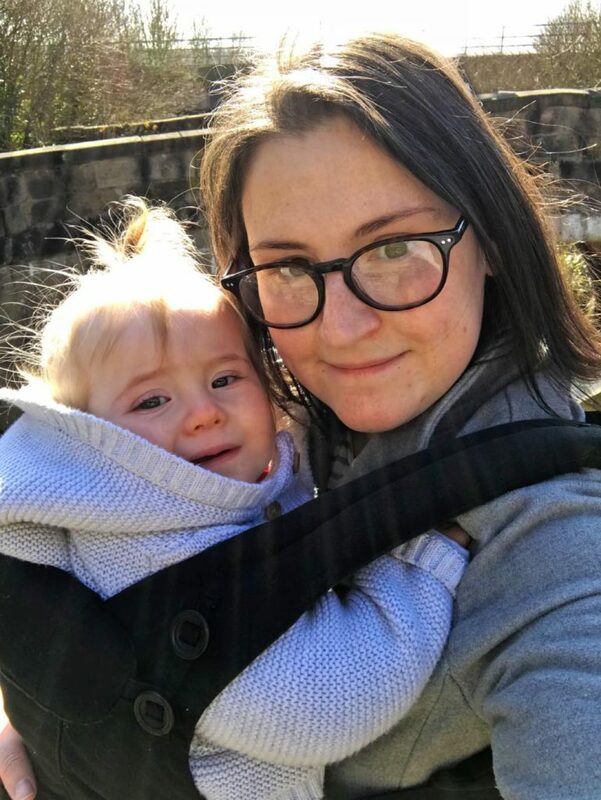 It goes without saying that you should try to use the stairs rather than the lift as much as possible (unless you have a pushchair with you – which is why I prefer a baby carrier). But, have you thought of making better use of the stairs at home? If your baby/toddler will tolerate being in a door bouncer for even 5 minutes, then put them in it at the bottom of the stairs and run up and down them for 5 minutes, fitting in 10 squats at the top and bottom each time. Avery actually used to find it hilarious watching me go up and down. Now she is older, she is trying to climb up and down the stairs with me! 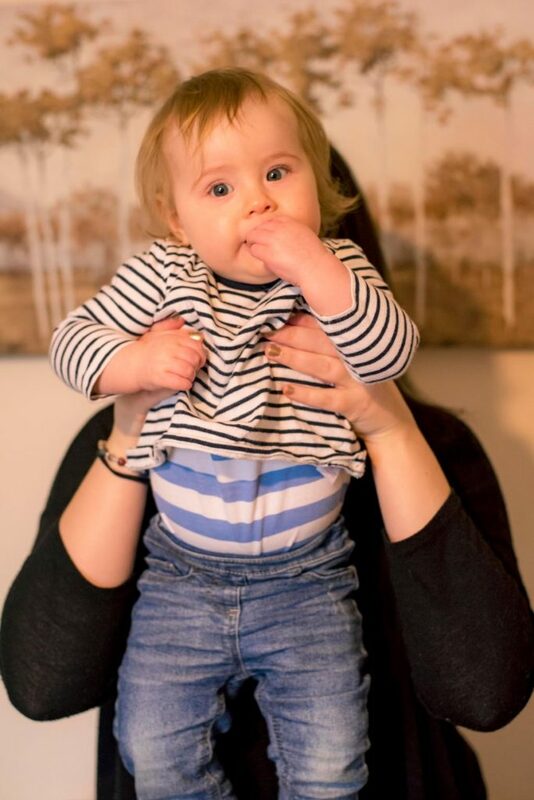 If going out for a walk with the pram isn’t quite enough for you, and you have a kid that will happily sit in the pram for 30 minutes, then buggy bootcamp is for you. There are parks all over that have these, and a simple Google of them in your area should give you a few results. Not only are they are great way to get fit as a parent, but it’s a good opportunity to meet some other parents in the area too. I have given a few activities on what to do when your kids are little, but as they get older it becomes easier because you can really get them involved. Things like going for a bike ride together, swimming or just a family game of football can rack up the step count for the day and you won’t even feel like you are working out and you don’t have to spend any time away from your kids. I love watching TV as much as the next person, and having that time at the end of the day to watch mindless TV and zone out is something I don’t want to give up. Whereas I would have usually just checked my phone during the adverts, Dave and I now get up and do a mini 4 minute workout. Jumping jacks, running on the spot and a few lunges soon get the heart pumping. We make it a game too. If it’s a food advert, so jumping jacks, and if it’s a car advert run on the spot. It works your memory too. I know, this is a bit of a lame one, but it’s more to remind you that you are probably being more active than you are giving yourself credit for. 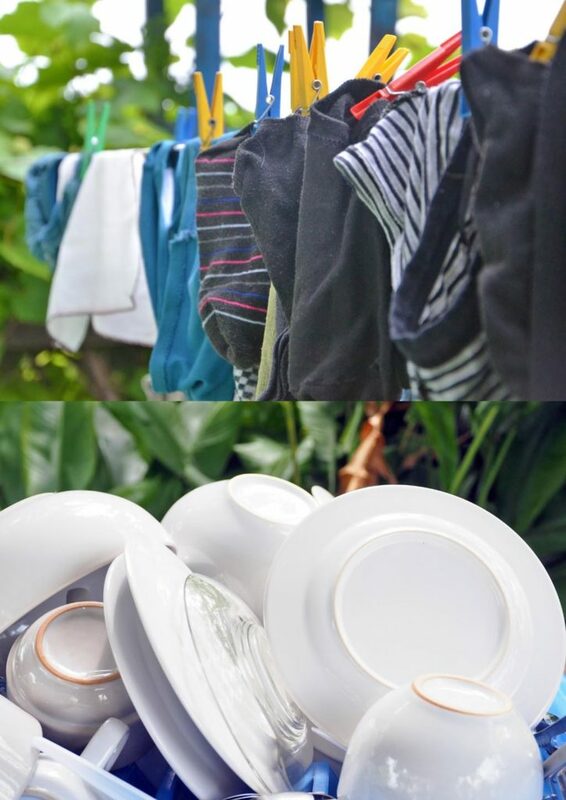 Have you ever worn an activity tracker whilst you are cleaning the house? All those trips up and down the stairs doing the laundry, constantly sweeping and mopping up after messy meal times and putting away all those toys at the end of the day builds up more steps than you probably think. Trying thinking about activity in a different way – it’s far more than the gym. If you do have time to hit the gym, then make sure you are using that time in the best possible way. Whilst 60 minutes on the cross trainer might burn a lot of calories, it might not be the best workout to get the results you want. Book yourself in with a trainer at the gym (most gyms offer this for free) and let them know what you would like to achieve in the time you have and they can work out a plan for you. If you only have a little time to workout, you want to make sure you are getting the most out of it. Childcare is expensive, and if you are paying out for that then it’s probably because you are going to work and you can’t use that time to workout. So, if you have a friend with a child a similar age and you can happily leave your kid with them for an hour, do a swap once or twice a week with them. It’s nice for your child to have a play date with a friend, and you can have some time to workout. You don’t have to go far – just go for a run around a park near your friends house, so you can get back quickly if needed. 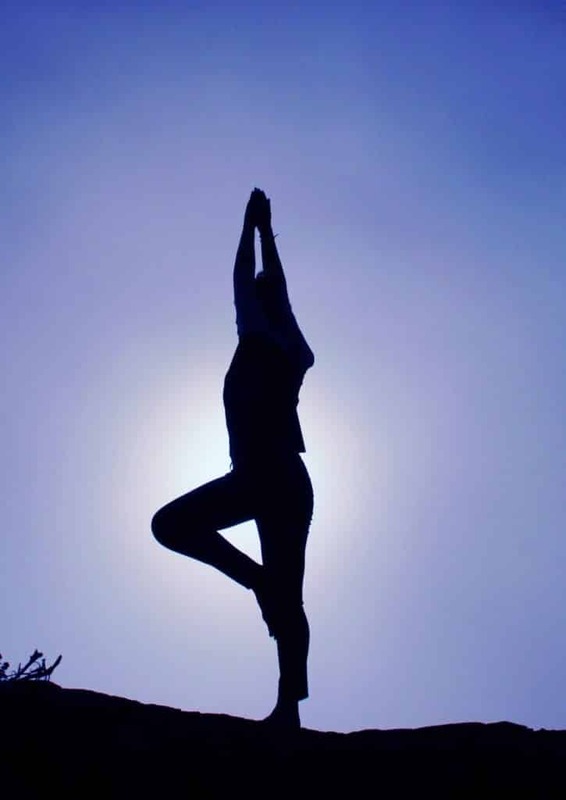 What I love about yoga is that you can really push yourself and have great workout doing it, but you can also do some more gentle, stretching poses to help you relax. The latter is how I like to finish the day. If all goes to plan and Avery is actually asleep in her own room, then I have a little time to myself before I go to sleep. I do a few sun salutations and gentle stretching poses and it really helps to relax before bed. During my chat with Amy at AXA PPP healthcare, she recommended that I try a meditation app for a few minutes a day, and I will be speaking more about that next month, but I am loving it so far. What it comes down to, is that I DO have the time to workout. It might not be an hour a day, and it might just be 5 minutes a day. But I can’t tell you how much better I feel even after 5 minutes of exercise. As a parent, just making 5 minutes to do something for yourself feels like a huge achievement. Making time for yourself is not selfish. How can you look after everyone else in your family if you don’t look after yourself. This challenge has really made me realise how much I need exercise in my life, even if it’s just 10 minutes, and how much of a difference it makes to my confidence. Since letting go of the all or nothing mentality, and doing all of these mini workouts over the past month I actually feel like my fitness levels have improved. My mental health is getting better by the day and when I look in the mirror, instead of criticising myself, I tell myself all the positive changes I have been making to my fitness levels. I take photographs of myself working out with Avery and I look at them and feel confident, rather than feeling sad. I will always stand by the fact that for me, the mental health benefits of exercise outweigh the physical. Fitness and health is not a size, and it isn’t just a gym workout. Find little ways to fit in fitness throughout your day, even as a busy parent. I always take the stairs when there’s a choice, and I often walk instead of taking the car or public transport if the distance is reasonable. It’s just about being aware of the opportunities to stretch your muscles during everyday life. Excercise is best way for healthy living. We should maintain exercise daily. It gives us mentally satisfaction and healthy life. I enjoyed this post. There are some insightful tips here. If you’re going to improve your health, then these tips could be a great starting point! Excercise is the best way to get yourself fit. If you are working person don’t sit continuously for 2 hours, just take a short walk after some time. Thanks for sharing the tips, I loved your tips!! These tips are great! It is so true how important it is to fit in a bit of exercise as and when you can. It makes me feel so much more energised, and if you’ve really smashed it on the exercise front, you can feel less guilty about eating that slice of cake. These tips are such an easy and great way to incorporate exercise into a busy schedule as ultimately we can’t have a healthy balanced lifestyle without the exercise. I think if your workplace isn’t too far, walking or cycling to work can make such a big change in your life. I have an electric bike now which is so great when you don’t want to over exert yourself but still fit the fitness in. Plus you don’t have to arrive to work sweaty or even change. I always go through phases with exercise I either do lots or none at all. Its so bad, I really need to get back into it as I notice I always feel not just healthier but happier in myself when I am exercising. I agree, i think there’s a sort of point you have to get over before the healthy habits you’re trying to have actually feel more natural rather than things you have to push yourself to do. even exercise you enjoy. I love a walk daily as part of a work-out, quick fixes are a great idea in a busy life. It’s true, exercise is usually the first thing I give up when I’m having a busy week or month. It’s a shame though because it’s so important! I quit gym about a year ago and HIIT is now my best friend and I find I can easily fit in a few sessions a week, and it’s so effective! I love this – Its so easy for gym buddies to just believe that everyone has time to go to the gym. I’m currently experimenting different ways of fitting in exercise with 3 kids – Its not easy but little steps make me feel so much better. I need some of these tips! I haven’t been to the gym in 2 weeks, need to get back into the swing of it!